Designed to restore normal collagen production and strengthen artery walls. Shown in animal studies to increase protein synthesis in muscles and intestines. This dietary supplement has been formulated to provide L-proline, one of 20 amino acids used by the body to synthesise proteins. Proline and its derivative, hydroxyproline, are used in the biosynthesis of several proteins and are involved in multiple biological functions, playing a particular role in maintaining connective tissue. This supportive tissue is present at various sites in the body, including the blood vessels, muscles, joints, skin, hair and nails. Proline is the sole precursor of hydroxyproline, a major component of collagen. Representing almost 80% of the weight of connective tissue, collagen plays a key role in the body’s structure and mechanical resistance. It is a kind of ‘cement’ that holds together the skin, cartilage, ligaments, tendons, blood vessels and arteries. Maintaining these different structures requires constant renewal of collagen from proline, hydroxyproline and glycine. The subject of extensive study, proline has demonstrated protective effects on the walls of blood vessels. Firstly, it helps strengthen the vessel wall through its role in synthesising collagen. Secondly, it appears to prevent certain cardiovascular problems by preventing the accumulation of atheromatous plaque on artery walls. This cardio-protective effect may be related to its ability to chelate lipoprotein(a), raised levels of which are a risk factor for cardiovascular disease. Involved in various biological functions, proline is an amino acid synthesised by the body from glutamic acid. However, studies show that this endogenous production tends to decrease with age. Through its effect on collagen synthesis, this gradual decline in proline production could actually be responsible for certain age-related problems. A lack of collagen potentially affects our skin quality, the structure of our joints as well as our cardiovascular health. Supplementation with L-proline may therefore offer benefits in preventing precisely these kinds of problems. 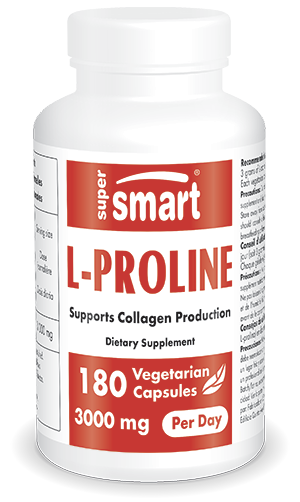 This new L-proline supplement has been developed to restore normal collagen production and thus prevent issues such as decreased skin elasticity, loss of weakened hair, brittle nails and even hardening of the arteries. Providing vital support for connective tissue, it comes in 500mg vegetarian capsules, with a suggested dose of up to 6 capsules of proline a day, though this can be adjusted in line with individual needs and the advice of your therapist. You may also be interested in the benefits of other amino acids such as L-Lysine for bone health, and L-Glutamine for post-sports recovery. Other ingredients: microcrystalline cellulose, magnesium stearate. Each vegetarian capsule contains 500 mg L-proline. Recommended use: Take at least six vegicaps a day (ie, three grams L-proline) in two doses.